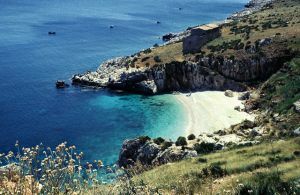 The Reserve begins in Cala Mazzo, near Sciacca, and stretches all the way to the Tonnarella Dell’Uzzo. It extends for 1650 hectares, with 7 kilometers of rocky coastline, marked by numerous little beaches and cliffs rising up to 914 meters (Monte Speziale) above the sea. The Reserve’s territory is the result of an intermingling of human activity and natural evolution; in fact until recently most of the land was farmed. If you want to visit the reserve take a look to our estates in the area, such as our villas in Castellammare del Golfo. The Zingaro Nature Reserve will enchant you with its rugged beauty and its intense colors in every season, its white beaches nestling in a turquois sea, the ubiquitous dwarf palms, the luxuriant Mediterranean scrub, the tough olive trees and the majestic carob trees through which you can glimpse the comely shapes of farmhouses. From the sea the gravelly inlets look like niches carved in the dolomitic walls. From south to north you will find: Cala della Capreria, Cala del Varo (which can only be reached from the sea), Cala della Disa (or Zingaro), Cala Beretta, Cala Marinella, Cala Torre dell’Uzzo (where the white rocks make the sea so transparent that you will feel like you’re in the tropics), and finally Tonnarella dell’Uzzo. The underwater landscape is a multicolored variety of shapes and species: fish, algae, sea anemones, corals in shades from orange to fiery red, sponges yellow, purple and red. Many and very interesting are the underwater passages and caves, so much so that they are the object of many studies. The best known are Grotta del Colombaccio, Grotta della Corvina, Grotta della Craperia, Grotta della Mustia, Grotta della Ficarella.